RowHeader can be enabled by setting “SfDataGrid.ShowRowHeader” as true. 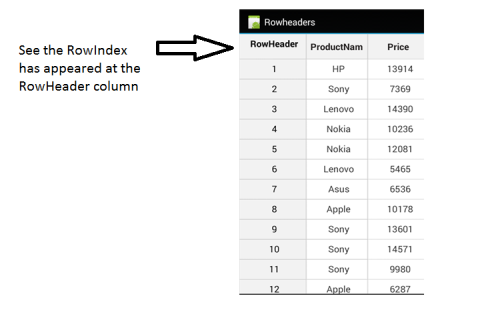 To display row index in RowHeaderCell you need to customize the GridRowHeaderCellRenderer and replace it in the “SfDataGrid.CellRenderers” collection. Refer the below code example to create a new customized renderer for RowHeader and replace it in the cell renderers collection of SfDataGrid. The below code illustrates how to customize the GridRowHeaderCellRenderer to display row index in RowHeaderCell in SfDataGrid.